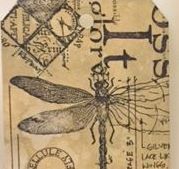 Time for another technique tag Tim Holtz style at The Craft Shack! This month I used his "Rusted Grunge" technique which is so realistic & easy! The background of the #8 manila tag was inked with old paper distress ink using a blending tool & flicked with water. It was then stamped using Tim's Classics #1, Classics #3 & Classics #4 in black Archival ink. Now for the technique...the Movers & Shapers jalopy & arrow were cut from grungeboard then pressed into distress embossing ink, covering the entire surface. I did miss a few tiny spots but that'll be OK. Next the die cuts were covered with vintage photo embossing powder & embossed with a heat tool. After the EP & grungeboard were totally cool, I scratch the surface with my fingernail to remove some of the granules of the EP. This gave it a little dimension. Using a blending tool, I went over it with vintage photo ink, pushing the ink into the EP. Voila! There you have it...rust! It's hard to see but I added a little patina. With a paint brush, I randomly dabbed the arrow with cracked pistachio paint. I also used the rust technique on a gold 4mm brad which is used to hold the arrow on the tag. I placed the tag in a page pocket & will keep it in my Tim Holtz Worn Binder Notebook for future reference. The #10 manila tag was covered with the wood grain paper from Tim's Christmas Paper Stash. 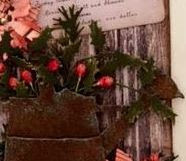 It wasn't quite long enough but I added a strip of Yuletide Design Tape at the bottom which was a great place to set the watering can. The watering can was rusted using the technique described above, I die cut Tim's BigZ Watering Can & added the patina. It looks just like one I have in my flower garden! After the watering can was decorated I used black foam squares to pop it up. 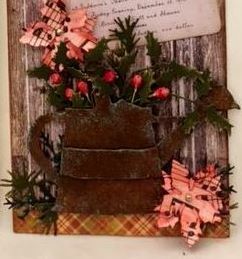 The pine & holly are several dies from Tim's Mini Holiday Greens set & were die cut from various colors of his Core-dinations Shattered Collection, sanded & adhered behind the watering can using glossy accents. The beaded berries (which I love!) were colored using fired brick stain & a peeled paint marker on the stems. The poinsettias were done by covering a small piece of white CS with melange tissue wrap using matte collage medium then I die cut 6 small poinsettias using Tim's BigZ Tattered Poinsettia Die. They were inked with festive berries & adhered together using glossy accents & a mini gold brad then attached with a glue dot. Oops..I messed up the one at the top so I cut & inked plain white. In the middle, I tucked a "Holiday Party Invitation" from a pack of festive ephemera. 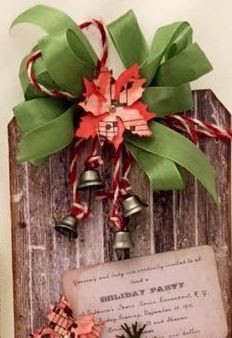 At the top, 2 pieces of Christmas Jute were intertwined into the SU ribbon (I was out of crinkle ribbon) with 4 of Tim's tiny bells tied to the ends. Love this tag.Thank you for the inspiration!